KWZ Iron Gall inks are no strangers around here, and that's for good reason. These inks are pretty, well-behaved, and stand the test of time. Previously, we've written about KWZ's Iron Gall Blue #1, Blue #4, Gold, and Gummiberry colors, but the Green #4 is a new one for me. I've had this sample for quite a while, but this one went unnoticed behind other samples until I did some cleaning in the ink supply drawer. Once I realized I'd never tried it, I put it in a couple of pens immediately to give it a shot. Just like the other KWZ inks, I was happy with the results. To provide a little background, this ink is categorized as "Iron Gall," which really means it's nearly permanent once it meets paper. A chemical reaction happens between the ink and the page that makes it highly resistant to water damage, fading over time, and losing its color over the years. Iron Galls are great for archival quality projects, and this Green #4 is just as good at the job as the others. Vanness has a great overview of what makes the KWZ Iron Gall inks special if you're interested in learning more. Once you get past the Iron Gall archival aspect of this ink, there are only a couple of other things to consider when using it. For one, you might be surprised when the ink dries either the same shade as when it's wet, and (in some cases) it actually dries darker. Most inks become lighter as they dry, which can diminish some of the original pop of the ink color. Not so with the Green #4. It stays the nice medium-green color and dries a bit darker in the wetter spots. The other thing to remember when using an Iron Gall ink is that it should not stay in your pen for long periods without being used. To me, I don't view this any differently than other inks, in so much that I like to clean out pens if they've been unused after about a month. If you're mindful about how long the ink has been in your pen, you should be fine. However, if the pen you're using has special sentimental value, or is difficult to replace, you might be a bit more careful about keeping it clean. Either way, these KWZ inks are fairly gentle, and I've never had an issue with pens getting clogged or becoming difficult to clean. Now, after those differences, the Green #4 acts just like any other ink. The color is a wonderful woodland green with brown hints and a very subtle gold shimmer in certain lights. I wasn't really sure about the color when I first started using it, but I grew to love it because it has an abundance of character. The shading is a large part of that character, along with the subtle shimmering effect. The shading isn't dramatic, but it's definitely noticeable in nibs from the F size and higher (German standard). It's a perfect amount of flare for the color. The other fantastic quality of this ink is the dry time. In most cases, it's dry between 8 and 12 seconds. In fountain pen terms, this is very quick. Really, it's astonishing how quickly it dries, and the other KWZ IG inks are pretty close to this as well. Definitely something to consider if quick-drying inks are your preference. At the end of the day, the KWZ Iron Gall Green #4 is a lovely medium or dark green ink that behaves wonderfully in all pens and on all papers. Just like the other KWZ IG inks I've used, I highly recommend this color. It's a very strong contender in the "work safe" green ink category, and it gets bonus points for being permanent. You can find KWZ Iron Gall inks at Vanness Pens in 60ml bottles or 4ml sample vials. Posted on August 17, 2016 by Jeff Abbott and filed under KWZ, Iron Gall, Ink Reviews. I’m a fan of Iron gall inks, especially the more modern varieties like this KWZ Gummiberry from Vanness Pens. Iron gall inks can be intimidating if you are unfamiliar with them, but the way companies manufacture ink these days helps keep your pens safer as long as good fountain pen hygeine is used. KWZ is a brand I have heard of in passing over the last few years. Made in Poland by Konrad Żurawski, the inks are made in small batches. This allows for experimentation with a wide range of colors that I personally haven’t seen before, especially in the iron gall realm. Lisa Vanness asked me which color of the lineup I wanted to sample, and Gummiberry jumped off the page at me. I have enough blue and blue black inks to last a lifetime, and I’m a fan of Rohrer & Klingner Scabiosa, so I figured I’d see how another purple iron gall ink would compare. Gummiberry is a grape-colored purple. It hits the page similar in color to the juice found in a grape jelly jar and dries into a color as deep as the deepest recesses of the jelly itself. From a distance, the aged color is nearly black, but a closer look shows that the deep purple color is retained. It has a wonderful look on the page. Iron gall inks are generally quick drying, and this one is no exception. Even on slick Rhodia paper there was little smudging after 10 seconds, which puts it ahead of most standard inks. The ink is also waterproof, forming a bond with the paper after drying that is not able to be washed out. This is why iron gall inks were the historical standard for important documents and signatures. As much of a fan of iron gall inks as I am, I am concious that without proper pen maintenance and cleaning I could be opening up myself to problems in my pens down the line. As I mentioned earlier, most iron gall inks these days are tamer than their predacessors and I have no problem keeping them inked in my modern pens for weeks, if not months, at a time. KWZ has an excellent page set up for fountain pens and iron gall ink maintenance that you should read prior to getting into these great inks. I’m anxious to try more of what KWZ is offering, if nothing else for the colors offered (turquoise iron gall anyone?) My thanks to Vanness Pens for sending me this ink at no charge for review purposes. I’m hooked, and will definitely be purchasing more at the DC Pen Show next month. Posted on July 13, 2015 by Brad Dowdy and filed under Ink Reviews, Iron Gall, KWZ. My fountain pen education, with the assistance of my friend Thomas, hasn't just revolved around pens, but the inks that go in them as well. Iron gall ink has always fascinated me - and confused me - and with his help I have been able to try out some of the most popular and unique iron gall inks around. 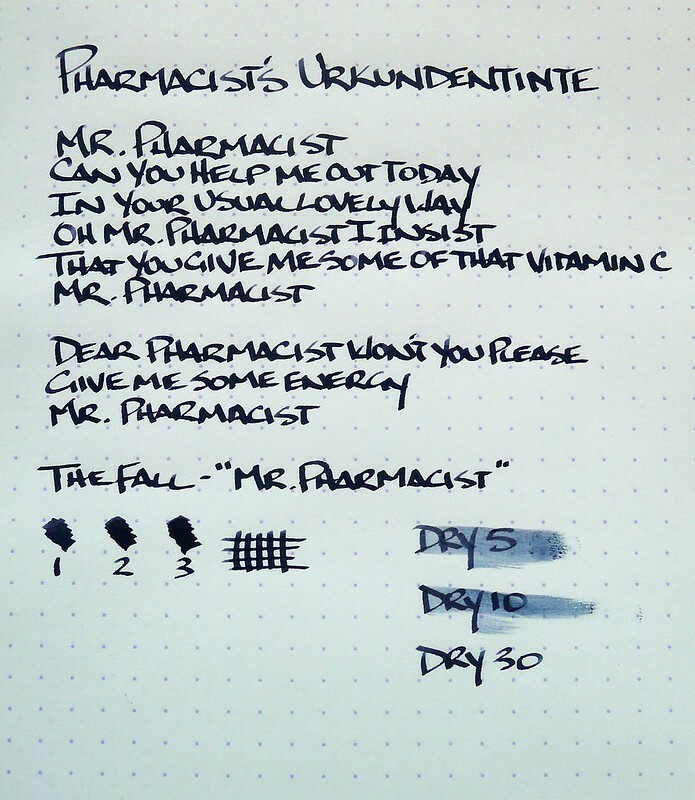 Pharmacist's Urkundentinte (aka "Document Ink") is not an ink you can order from any store but rather from a member of the Fountain Pen Network named Pharmacist. He makes his own iron gall inks based around traditional recipes, and according to Thomas, they contain twice the amount of iron gall content than other iron gall inks. What does a statement like that mean? It means you need to practice good fountain pen hygiene. There is no need to be afraid of inks like this, as I was initially. Most off the shelf iron gall inks these days are reasonably tame, and even stronger inks like this Urkundentinte take only a little additional care. With a steel nib pen, cleaning every week or two would be more than sufficient, while non-corrosive nibs like gold you could go even longer. Some people keep their iron gall inks segregated in specific pens, but as Thomas told me "Don't be overly freaked out -- it's not going to melt your pens." As I learned quickly, a single written review is not going to do an ink like Pharmacist's Urkundentinte justice. The inks goes on the page in a deep blue black shade and dries to black in a short amount of time. As the hours and days go by, the ink oxidizes into a deeper black and becomes permanent on the page. That permanence is why these inks were so popular historically. You couldn't sign important documents using anything else. I'll work on a video or a follow-up post to see if I can capture the ink transformation better. Could an ink like Urkundentinte be an every day writer? I think so, especially for those looking for permanence in their ink. It dries quickly, despite the smear in my 10 second sample - I pulled the trigger a little quickly. I'd say it is dry in the 12-15 second range on this Rhodia DotPad, which is better than many inks. On standard copy paper the dry time would be much less. For me, I don't think this will make my every day rotation due to the darkness. I prefer a bit more blue to come through, starting light then turning a darker shade but still noticeably blue. I'm testing out other iron gall inks like Rohrer & Klingner Salix that fit the bill better for me. Still, Pharmacist's Urkundentinte is a spectacular ink if nothing else for the history behind it and the commitment by its creator to be as authentic as possible. There is much more to learn about iron gall ink and these links and reviews below helped me get started. I'd love to hear your experiences with iron gall inks so please let me know your thoughts in the comments below. Posted on July 8, 2013 by Brad Dowdy and filed under Ink Review, Iron Gall.